Pretzel Logic's Market Charts and Analysis: SPX and Dow Update: Is the Top In Place? SPX and Dow Update: Is the Top In Place? Sometimes you just spend too long staring at charts. 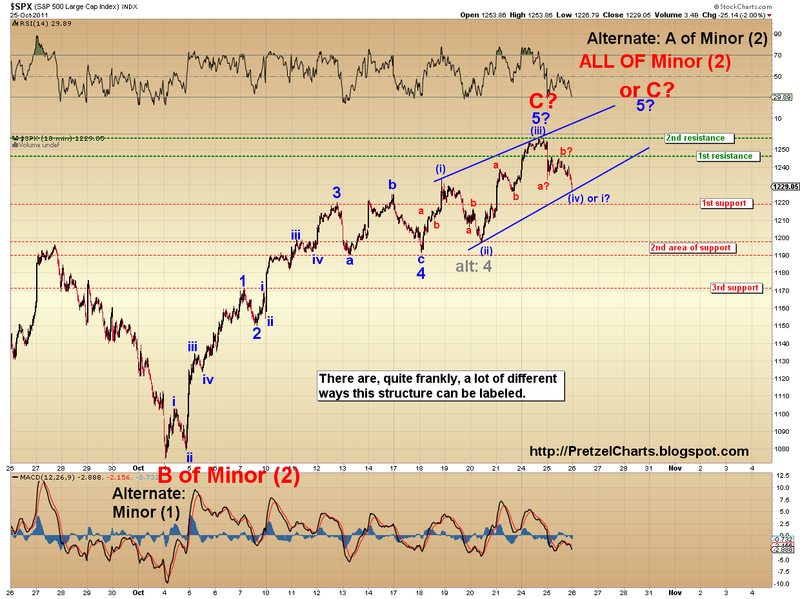 Yesterday, on my blog, I warned of the possibility of a fifth wave failure in the NDX and SPX. After the close Tuesday, I took a much needed break and spent some time with my family, then came back and looked at the charts with fresh eyes. After reviewing the charts again, I don't think we had a fifth wave failure, I think we had an extended fifth of wave 5, meaning my labels yesterday were off by a degree... what I was labeling as iii yesterday was likely v.
Calling tops is always much more difficult than calling bottoms. But the move on the Dow is perfect for a top -- if my wave count is correct. This Dow chart shows my preferred count; the SPX chart shows my alternate. Interesting anecdote: I was talking yesterday with several of my more experienced trader friends, and without exception, all of us were warning that the bears "shouldn't get too excited yet." Later, I got to thinking: "Isn't this exactly how a top should feel?" Even bears are afraid to go short, and are looking upwards for "one more leg up" to get short from. That's a contrarian indicator if ever there was one. Interestingly, the potential ending diagonal I've been talking about since last Wednesday is still alive and well. If the ending diagonal is real, we should see another new high. This is part of what I meant when I said there's still room for interpretation in the charts. In a perfect world, the highs will hold, and the Dow chart and my preferred count will ride off into the sunset as the credits roll. But we all know: this ain't a perfect world. So it remains to be seen if my call from Friday's pre-open will go down in history as one of the great top calls... or not. Obviously, any move above the recent highs would indicate that the current wave up is still unfolding. The Dow chart is also annotated with three key levels to watch. For complete confirmation of a major trend change, we need to see the blue wave 1 high broken, but there are two other levels that will be very good early warnings: the red trendchannel, and the wave 4 bottom (the wave iv bottom is another, but isn't annotated). Trade safe! It converges enough to still count as an ED. which means the potential top could be around 1280-1290? 1275+- is still our target for SPX? Or as high as 1340? 1260-1275 under ED count. My preferred count is that the top is in. Is my article that bad that this isn't apparent? lol. had to rush it. FWIW, I am covering that shorts that I initiated at Monday's close here. I just don't see a clean wave count off the top and with all the news flow today I would rather just book profits and sit this one out. I'm gonna be staying flat today, so I won't be around the comment section the rest of the day. Trade safe guys and remember you don't always have to have a position in the market. When the picture is muddy sometime the best trade is no trade as the market will always be there tomorrow. Pretzel - great board - good insight. I am short and concerned about the stab up to 1275 - be it the end of C of iv (?) or the ED. On separate note - I go to Daneric site a couple of times a day -- some thoughtful analysis there as well - but some spamming too. If I posted there that your site has good insight and thoughtful analysis - you would probably see bigger checks from Google - but you might see some spamming as well. LEt me know - happy to help. My shorts still looking good I am a gonna hold on for now. If SPX breaks the blue channel line, I am looking to add to my shorts. I thought the gap up/bounce this morning looks pretty anemic... am I delusional? CTP- yep, cash is a position too. WTF, why am I doing a chart for you if you're leaving for the day... won't matter by EOD, lol. POTUS, thanks. Spamming in the comments, you mean? after this early gap up, does 1220 hold any significance still? spamming meaning that you get some jerks that come in and make comments that are not helpful and sometime derogatory. FWIW, you have a solid, growing following here w/o risking known 'irates'. A friend in the car rental business coined that term for the occasionally unpleasant customer. POTUS, these guys are regulars, in other words? As in, I'd constantly be deleting comments? what do you make of the silver chart? Is still going to head down from here? NDX in the red now. think I answered my own question...1220 still stands as the neckline so it will be support...Pretzel labeled it as such. Silver hmm. Egads. Not at all what I expected there, lol. And that's why I don't trade silver! Could still be part of a fourth wave... or it could have just been a big ABC off the high, meaning silver's going to a new all time high, which is scary. Five waves down off the gap high now, in SPX. Not what bulls want to see. the articles are part i of the the day, the comments section become part ii - in real time..
hehe, I do, most definitely...a lot going on in the charts and with so many counts right now, sometimes I just confuse myself. I'm starting to get the hang of this Elliott Wave stuff. Great articles and blog. Also glad you spent time w the family. Money is the means to enjoy life, not the end in itself. yes money comes and goes, assets deflate and reinflates... only family and friends stay. And health too, all the more important. DIA and SPX going back below the red H&S line, let's see when it bounces how it backtests..
SPX just broke yesterday's lows. Does it mean top is in and we are starting a big downtrend now? SPX testing the channel, 1220 support next? The killer for me is that the market opens at 3:30 a.m. here in Hawaii. So the hours are killing me. That's why I usually "call it a night" after the market's been open 2 hours or so. It'll get a little better after you guys do DST, then it'll open at 2:30 am here, 'cause we don't do DST in Hawaii. Still can't confirm, but yeah, my preferred view is that the top is in. 1197.34 SPX is where the bulls will be in real trouble. That will take several alternate counts off the table. RE: FAZ. I don't really chart the leveraged ETF's b/c the leverage screws up the waves too much. if US dollar/Euro chart stays anything like what it is currently - BIG bearish wick -- won't be good for SPX. Re: regulars on Daneric's site -- the regulars are good and insightful - the lurkers are the ones that sometimes post and are annoying. The site does do a pretty good job of policing itself. SPX starting an acb rebound after 5 wave down from the gap top? Thanks, Pretz, for your fine work. Your call Fri. before the open was spectacular. vix is above its 150sma on several intraday charts, I would think it needs to test 150 on the daily at least. a move to spx 1197 might acheive that. an abc rebound here would totally fake me out becuase of Pretzel's alternate ED count and CTP's preferred count of a wave 4 down. buckle up. Spiker, rebound should stay below the morning high if the count's right. Then the SPX should let go in a nested third. Re: dollar. The weekend prior I did a LT dollar chart, showing us about to enter a third wave up. Good for business if that holds. ED count is off the table, btw. Yay finally the ED is dead! Oh, I thought 1220 defended the ED (head spinning), glad it's dead, but I'm looking through your charts, do you have an alternate count that says the top isn't in? assuming the long term view of a bear market still holds...only count I'm aware of that says we could break north of 1250 is CTP's wave 4 down count. Do you think that count is viable at this point? 1220 defends the top of wave i of 5 of the last leg of the rally (see Dow chart, and imagine SPX labeled similarly). I guess I need to get better at explaining stuff in the articles. CTP's count is still viable, but it's not my preferred view. markets are rallying from the 1220 mark. What do you think the top will be? The diagonal that would not die, very funny. You're doing a good job Pretzel, it's a complex system so for the novice like me it can still be a bit confusing. ANON - pretzel was saying that this thing shouldn't rally higher than today's high if the counts are right. Hope I'm not mistating. I was talking very ST for a turn at 1234ish, then we'll see what happens. Could go down right into a third wave, could turn into a larger ABC and rally higher. It's harder to make ST calls when the big turn structure is this young. There's still a lot of options on the table, so waves can morph into things you aren't expecting. I was planning to take a day off from the market today, but curiosity got the better of me and I took a quick look at the intraday chart. In doing so the very muddy picture I saw this morning has become clearer to me. My mistake was misreading the squiggles yesterday where I did not see an impulse down, but studying it again I realize what I missed. Basically I see 2 clear options at this point. 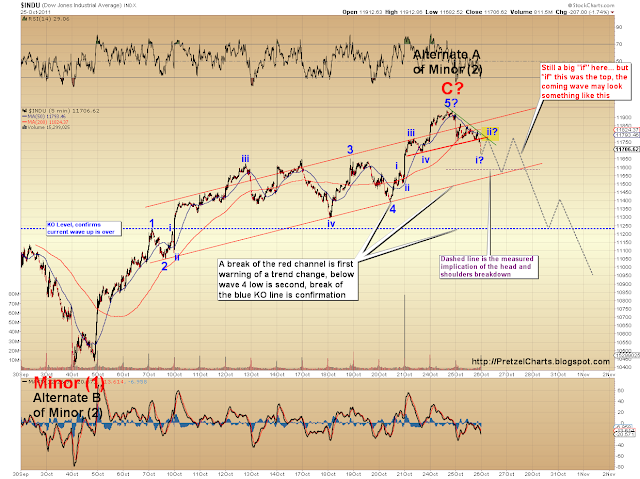 The first is Pretzel's top is in bear count in which case a break of the intraday lows should result in a 3 of 3 down. This is not my preferred count. The second is that a break of today's intraday high would lock in a 3 wave a-b-c down which would confirm my wave 4 of C count meaning one more run to new recovery highs (1275 SPX?). This is my preferred simply based on my cycle work which was calling for 10/27 +/- 1 low. btw, below 1228 and all bets are off for 1234. Yep, today's high is critical now for the bear count. CTP, where are you placing the wave 3 top? W3 top on 10/14 then a-b-c flat W4 on 10/20. Then 1 of W5 at Monday's highs, and 2 of W5 completed this morning (unless of it's going to be a complex correction). CTP, problem I have with that count is the fifth wave gets too big then. Wave 1 was 59 pts. If 3=1, then that's 1280, with the 5 to come. It would have to form an ED to reign it in. Yes could form an ED... Also another bullish fallback would be your original ED just as an expanded ED instead of a contracting ED, where we are now in the final 5th up. Yeah, could. I still like my count better (not surprisingly, lol). I think we'll make a new low today or tomorrow and knock some of these other counts out. Parameters seem pretty clear for bull vs bear counts, so now we just have to wait for market to declare itself, most likely dependent on new coming out of EU Summit this afternoon. Well, if you count is the right one then we should see major downside acceleration soon. CTP- a 50 point subwave 1 in a 5 sounds awfully big. that would be one helluva rally. maybe hitting the 1307 fib resistance? I am not positioned for that type of move at all. Looks like the flatline for the past 2 hours is starting to leak lower. wait so what are we looking for the bullish and what are we looking for for the bearish signs? from what I've gathered in the blog, a break of 1220 should send us to 1197 at the least. If it continues to hold, we could run up to the intraday high around 1242. Pretzel thinks 1242 needs to hold as the high today for his count that this is THE top. Just added a little more to my short positions... top or not, we miss 100% of the shots we don't take. all the intraday Moving averages I've looked at (RUT, VIX, SPX) were holding as resistance to the upside which implies we go lower. I don't see what new news could come out of Europe here to send us higher. The rest of the day looks quiet from a headlines front (atleast no data is scheduled for release) which would imply we continue a decline. If we can't break 1220, I will probably cover some of my shorts. But I'm a newbie to the blog and Pretzel went to bed so don't take my perspective as gospel or anything. Just one more opinion. How does Hurst cycle work? How do you determine the dorminant trading cycle? The answer to that is going to require alot of explanation. Remind me again after the close today and I will expound on my use of Hurst methods in more detail. Today's intraday high and low are the parameters for bull or bear watch for a break either way as the tell. Pretzel in leaning to the bear count. I am in favor of the bull count due to my 10/27 +/- 1 cycle that should be a low based on my interpretation. I'm going to be in and out throughout the rest of the day. I will check in I I see something noteworthy, but I think the parameters are pretty clear at this point. I seem to be the market contrarian today. That was a fairly violent move back to 1234, but pretzel did call 1234 as a possible ST high. vix and rut just hit their 50s on the 15min chart. They've held all day, let's see if its enough to fight back the bulls here. whipsaw is the order of the day. Pretzel, I know you are sleeping right now and all, but I wanted to put in a request for the weekend. I'm hoping you will update your long-term SPX count and expand on your analysis. I would like to understand how you came to label the 2007 top as Supercycle III, and your interpretation of the larger trends since the 2000 bubble. on the first DOW chart, the top seems like it was suppose to be at 11824 and we've already crossed that. Does that have any significance? yes lots of violent whipsaws today, that's why I chose to sit it out today in cash. News driven tapes like this are treacherous so no need to be a hero. But if I had to be long or short here I would choose long. yeah just when I said there are no headlines...there is a headline, LOL. "China to invest in EFSF". Didn't we already expect that? You're right CTP, the rumor mill and these headlines make trading difficult. I'm right along side you Frank. I am not ready to give up yet... oil not confirming the strength of the SPX here.... don't know if that's significant. CTP - can you share a chart of your count? I'd be interested to see how you have this being a 4 down. Please share your insight into how you do your hurst cycle work after the close. yeah, if that holds today...you can look at Pretzel's chart and projected dotted lines above and it has traced perfectly back to the intra day high. which chart is that rockytop? it's actually the Dow chart in this post, the very first one. S&P playing chicken with this intraday high still. 35 minutes left in the day, I bet we get a big move in one direction or the other as we close. XOI and HUI hitting new recovery highs, DJIA getting close. does this mean we're going to test new highs? try to go to the 200 day moving average? so CTP, if we close up here, that means we'll be making a new high in the near future right? any reason to think Monday's high will hold? You know my stance, it hasn't changed. I continue to look for higher highs based on my cycle stuff. don't think it will be a rocket ride though, probably very choppy advance at least until right at the very end when it probably goes into quick parabolic short covering panic. So 1260 - 1275 is the next level to watch? they don't want to make it THAT easy for us afterall. First things first, bull must recapture 1250. Bears will put up a fight there and we could be in chop mode for another 1-2 days while the market build a base here (assuming my bull scenario). If 1250 is retaken then I would expect next stop to be 1275. Weak finish today, I have a feeling it's gonna be a tough slog as bulls and bears duke it out the next couple days. Fading intraday momentum either way is probably going to be the way to go. I'm gonna stay flat and let the HFT robots have their fun jerking the tape around and picking everyones pockets. When a clear trend re-emerges then I'll consider getting involved. But my bias remains to the long side. I think his preferred count is still in play per the charts above. It actually looks like he anticipated a test back to 1242 but the question is, did the small pop above to 1245/1246 that quickly failed at the close some how cancel his count? I'm not sure how rigid Elliott Wave is to that regard. You gotta read this blog post from Ritholtz. It is so funny but yet so true LOL! Can't speak for Pretzel, but from what I am reading on other EW blogs, the bear count is still valid unless and until we take out Monday's high. No time for big bets either way. I am a chicken so will sit in cash but my cycle stuff in aligned with the bull count. To digress from TA into fundamentals for a bit. The way I see it the biggest problem for the bears is how incredibly crowded the short Euro trade is right now. And since stocks are taking their cue from every blip in the Euro it's a problem for bears that the short Euro trade is quite possibly the most crowded and one sided bet of all time. On the other hand the major problem for the bulls is that the fundamentals of Europe certainly more than justify being massively short the Euro. That's why I think this tape is so tough right now. Everybody knows the Euro-zone is doomed and they are most certainly correct. Which is why any long-term super bullish outcomes are not feasible. But at the same time it is Mr. Markets job to figure out how to screw over all those that are piled into crowded short trades. One way to accomplish this without a massive bull run (which the fundamentals can't support) is to just wear the bears down by whipsawing them to death. Which is exactly the phase we find ourselves in now. Everyone know the shelf life of this rally is nearly expired (if not already expired) but how many more violent whipsaws will it take before the bears give up and move to the sidelines? would you say the next whipsaw is down then? or up? To CTP: I understand your point that fundamentals would prevent a large bull move, on the other hand, I think the threat of QE3 and the money pumping machine really prevents there from being a big move south. As soon as things look like they'll crack - the FED will step back in. It is fun reading the blogs and listening to the back and forth. Other than some scalp trades (short AAPL and AMZN prior to earnings), it's tough sledding on the short side. It was much easier when we were stuck in the 1120-1220 trading range. Vulture good point. All of that would seem to suggest a protracted trading range market for a long time to come, but the biggest tail risk would be for a systemic unraveling at some point which is why it is so hard to play the long side for anything other than ST swings. I try not to think about that kind of stuff too much because 1) it makes my head hurt ;-) and 2) it is generally not too helpful to my ST trading. I pretty much just try to focus on the next few days to few weeks for swing trading purposes but every once in a while like to ponder the bigger picture on days like today when there St trading environment is not presenting good set-ups. The problem I see for the Euro despite the shorts is the upcoming ECB meeting. If they ease then that is $ positive if Fed holds next week. If Euro weaken S&P weaken correlation holds then the rally ends if dollar strengthens. If ECB holds then Euro stocks fall and I'm doubtful that S&P can withstand that sell pressure. I wouldn't be surprised with a rally to 1275 either. The two things that could do it are GDP tomorrow upside surprise and Fed easing or imminent Fed QE3 (asset purchases) spelled out in Fed statement. To me, it looks like an a-b-c off the lows. Expanded flat on SPX... Dow again a tell here as "b" held above yesterday's low, while a new low was made on SPX. On SPX: Morning pop was a (1226-1243), then b (1243-1221), then c in progress or done (1221-1246). That's the count *if* my top is indeed in. Pretzel, 4 hours...I feel for ya man. Less than 6 for me and I can't function. After you've had ur coffee, I've got a question. Are all 1,3 & 5 waves subdivided into 1,2,3,4,5 impulse waves and all 2 & 4 waves (counter trends) subdivided into a,b,c waves? or is it more flexible than that? Nice chart!... If your bear count is the right we should know it by the close tomorrow. Ty, you have tomorrow as a turn on your cycles, right? No specification to polarity, though? So tomorrow gap up for (v) of ED could be the turn? so tomorrow we're expecting a gap up to the 1250 level? Yes 10/27 +/- 1 so today's low could have been it if the bull count is right or tomorrow's high if the bear count is right. ES futures really acting schitzo tonight swinging up and down 6 points every 5 minutes. This EU uncertainty (will they? won't they?) and the way the market is held captive to every rumor and innuendo coming out of there is really getting annoying to say the least. Reminds me a lot of 2008 after the crash. btw, futures right now look like they're in a fourth wave (of possible c), so if they hold and trade sideways all night, maybe we do get a gap-and-crap day tomorrow. Anon, we're not really "expecting" anything at this stage. Market still hasn't declared its intentions w/ any conviction... so we're speculating likely possibilities until things clear up. the market has become a huge "drama queen" LOL! I can't remember the last time I saw the futures this active during the Asian session. hearing reports of an agreement on Greek debt deal, maybe that is what is spurring the activity. EU leaders and banks said to be close to agreeing a 50% writedown of existing Greek debt. wow quite the spike there! Yikes! ES still below Monday's high. Be interesting to see what happens when Europe opens. Yeah I never trust the Asian futures session, usually Europe goes the completely opposite direction. I hope that doesn't mean I have to stay up all night tonight to see what happens UGH! Nice 5 waves up in the futures now, starting to look like that was a 4th wave earlier. I wonder how many mountains of buy stops there are above 1.40 for the Euro? I would be very surprised if "they" don't take 'em out. True, been there done that. I have a really vivid memory from 2008, right at the end of the big wave 3 waterfall in October -- closing some puts as the SPX hit 850 (I was 10 pts early), calling my client 5 minutes later to tell them I was running late, watching the market spike, and really really wishing I didn't have to go back to work. Exciting times, but it sucked having to work with everything going on. Speaking of, ES/YM/NQ futures might just be running stops... I never trust the futures as much as I trust the cash session. Too easy to manipulate. Merkel says 50% cut has been agreed on Greek Bonds...but the Euro/Dollar hasn't moved. Shouldn't that pair validate a move like this by breaking 1.40 resistance to the upside? Still holding my shorts, damn! Rocky -- one would think there should be something. EUR/USD actually looks to me like it wants to go lower ST. Maybe 1.358-1.368 neighborhood. Wow, Pretz. You are getting a lot of comments now. You are getting famous. I wonder how many of us would be able to tell you what the E Waves and counts and price projections should be on an un-annotated chart. I sure wouldn't. If you're tired, Pretz, just do 1 chart, maybe the S&P, with minimal info and draw the expected future price pattern on it. That would be enough for now. No use in exhausting yourself. Hey, Josh. Yeah, very tired, and I haven't spent enough time w/ my family this last three weeks -- a few hours yesterday was a good start, but it's not like your kids stop needing your attention. We'll see what I come up with. Probably get the update posted right before the open again. eh, this volatility is enough to lay waist to even the best projections. Pretzel, I'm sure you're getting to this in your charts, but given the action in the futures...can a 2/B wave fully retrace a 1/A wave? Can you consider the futures as viable moves when charting with Elliott wave? or is that left to his/her own interpretation? I know I ask lots of questions. Thanks for the insight. Wave 2 can retrace up to, but not over 100% of wave 1... so if we break the recent highs in the cash market, the wave up is still unfolding. B waves can retrace up to 138.2%. Futures distort Elliott Wave analysis because of the extreme leverage, so they aren't considered reliable for EWT charting. i feel like waking up in the prehour morning and dumping all my money into UPRO or FAS. What do you guys think? 1275 should be a brick wall. If we get through 1275 SPX and 2438 on the NDX then we can start talking bull market. Is this enough bullishbess yet? Frank, I think I've got a handle on it FINALLY. Charts are pulling it all together tonight, and unless this actually *is* a new bull (which I don't believe), I think we are probably going to get that tag of 1275ish -- then the fat lady starts singing. The update will explain. Got the charts done, but gonna take a break and come back to write the article. Pretzel, so 100% is all that is allowed, no blowover in this scenario? Atleast that gives me a hard stop to work with. If the cash market prints above the monday high, then I'm going to cover my shorts and sit in cash until the top reveals itself. This volatility has crushed me. 1260 would be a bit surprising to turn on considering how close it is, but maybe 1275 is the magic number after all. My curiousity is, if we test 1275, surely by then the DJIA and NDX are well above their 200 day ma. Have you found it common that several of the indices break a resistance level like that but a single index reaching the 200dma can create a full market reversal?...or are we just saying the SPX is that powerful? NDX 2438.45. If we break that, it's all been a bull market correction at best. Doesn't mean we won't head down again, but it means this is not the mega-bear. Nope, charts all agree. It'll make more sense in the update. But, you'll see how it all pulls together. cool, bed for me. later. I was thinking of riding upro to 1270 and then switching over to spxu? Bah I wish I could see that chart sooner so I can set my alarm at 4am or not! I guess even if they can "supress" the bear this time and unleash the bulls again with all the monetary easing policies. Kicking the can down the road will eventually unleash a fiercer bear? Or we will have another lost decade with frequent recessions and the bull phases never exceed the prior high? Yeah, Frank, definitely agree that at some point, we have to pay the piper for all the excesses.